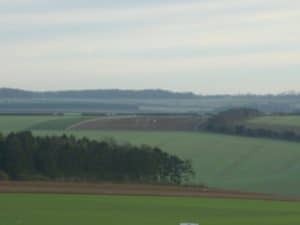 We were recently awarded a contract to plant a new block of woodland in accordance with the English woodland grant scheme. 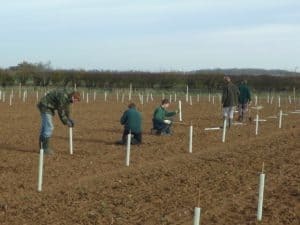 This involved planting almost 4000 trees on a freshly prepared piece of ground at Wadlow Farm near West Wratting in Cambs. The area to be planted was some 330m long by 80m wide. It was surprising how similar this task was to the setting out, laying and recording of tactical minefields, something which I had done a lot of in previous years. The ground had been superbly prepared by Stuart and Darren of Wadlow Farm using a power harrow. It was protected with a standard rabbit fence constructed by our colleagues at Advantage Environmental ( http://www.advantage-environmental.co.uk/ ) .The trees were all purchased as 60-90cm bare root whips from King and Co ( http://www.kingco.co.uk/) who as usual provided excellent stock. The species chosen were: Quercus robur (common oak), Fraxinus excelsior (ash), Cretageous monogina (hawthorne), Corylus avellana (hazel), Fagus sylvatica (beech), Malus sylvestris (crab apple), Prunus avium (wild cherry), Ligistrum vulgare (privet), Cornus sanguine (common dogwood), Viburnum opulus (guelder rose), Viburnum lantana (wayfaring tree) and Acer campestre (field maple). We also used the excellent tubex easy wrap guards. All tubes were secured with heavyweight bamboo canes which were easier to push into the ground. 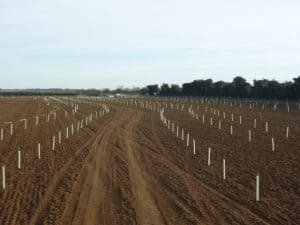 The trees were planted in irregular rows at 3m spacings. 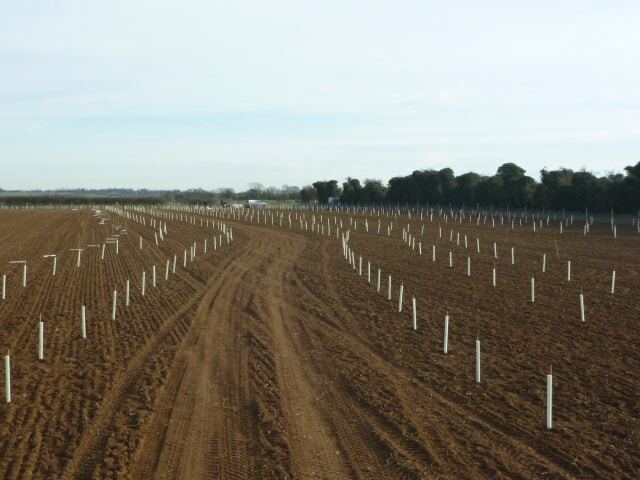 The outer edges of the block were planted at 1m spacing using the hedge species to provide a windbreak for wildlife later on. 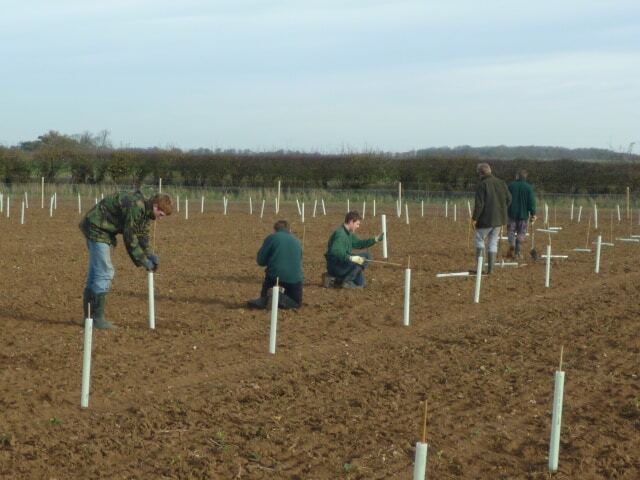 A five man team provided the main stay of the planting team with visits from our work experience members Robin, Luke and Aaron, Many thanks for the extra help. This extra assistance enabled us to complete the task in four working days.